Hello, and welcome to All Your Monies, where The Glorio Blog’s resident toy and figure collecting crew (and Aquagaze) will run down the last week’s new pre-orders, turning a loving or scathing eye over what’s been put out for you to spend your hard earned cash on. This week it’s a real bounce back as we’re blessed with a bunch of great figures. And an Oreimo one. Zigg: I think this guy (yes, guy) is one of the most incredible looking figures ever made. There’s detail and craftsmanship bursting out of every part of the sculpt, from the gorgeous tree base to his wavy hair. The yellow and greein is a very cool, unique colour mix and all those wings and feathers give it great movement and life. Paint looks to be beyond reproach. OK, that price is an utter joke, but this is a serious arthouse piece and looks to be being targeted as such. 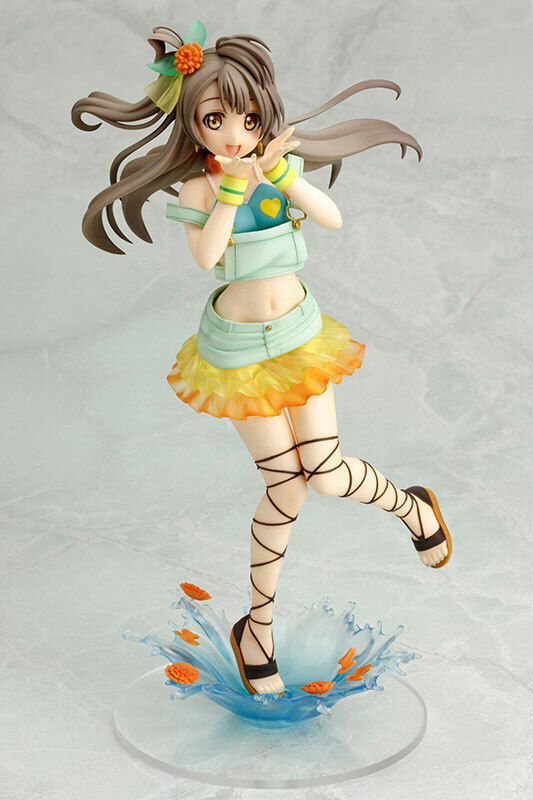 Jel: Alright everyone, this is the moment I officially declare Max Factory the best figure maker. Sorry Alter, you’ve been spinning your wheels for too long. I have no idea who this dude is but this is a stunning figure, from the pose to the audacious color scheme to the incredible amount of detail on his lute thing or whatever musical instrument that is supposed to be. The price tag is certainly hefty, but if you’re the type of collector that wants works of art on their shelf, you might want to pay up. Lifesong: While I don’t really want to buy this figure personally I am very much impressed by the overall craftsmanship. These wings are gorgeous and the fishhook in his belly button makes me cringe every time I look at it. Zigg: Extremely cute, without the creepy overtones one might expect from a Shinobu figure too. She herself is wonderful but what really makes this one is the base. The pile of donuts itself is a great and adorable idea but it’s the references to the other characters in Monogatari that really sell it, making this almost a little montage of the whole series. Kudos too to GSC for this re-release, as she’d reached silly prices on the second-hand market and I’m always keen to see good figures get in the hands of more people. 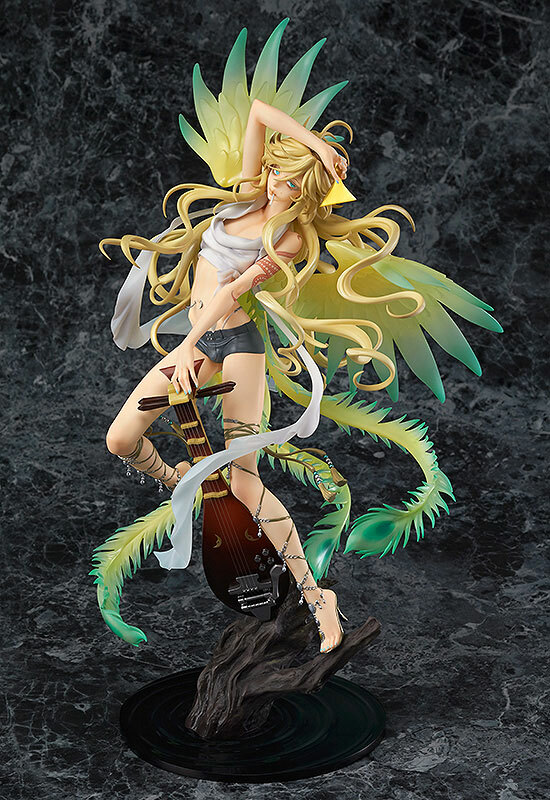 Jel: Strangely enough if you had to have one Monogatari figure this might be it. While Shinobu herself is pretty cute and everyone loves donuts, my favorite part is how they incorporated all the different iconic accessories of the other girls into the base. Of course this is a re-release of her now outdated Bakemonogatari design and Shinobu fans may want to hold out for her updated look but this is still a great looking figure nonetheless. Lifesong: Shinobu is cute as ever. Good Smile Company did a great job with this figure line and I think Shinobu is one of the best of the bunch. Like Jel, I appreciate all the addition of iconic accessories in the base. They add a nice touch of personality that brings this figure beyond just a Shinobu figure and make it something a bit more iconic for the series as a whole. Zigg: It’s been too long since we’ve seen a truly top-notch Nanoha figure, but as ever Alter are here to deliver the goods. Hayate’s looking awesome in her snazzy new movie design and as ever Alter’s taken the chance to blow out their cloth sculpting by giving her a sweet cape. The replacement parts are neat too – both arms can be swapped and her hair can be replaced with her ‘normal’ colour. I like this a lot, and desperately want to add her to my matching Nanoha and Fate, but that price is just too rich for my taste. Jel: Hey, Nanoha is back! It’s been so long since we’ve seen any of the girls in All Your Monies that I’m almost ready to be impressed again! Hayate does look pretty rad, especially with those gold metallic highlights, but the relatively static pose isn’t doing anything for me. I guess we can also hand out bonus points for not being Nanoha or Fate, but Hayate is probably next on the depth chart in terms of figure overload so I’m still not blown away. Lifesong: More Nanoha! Yay if you wanted more. 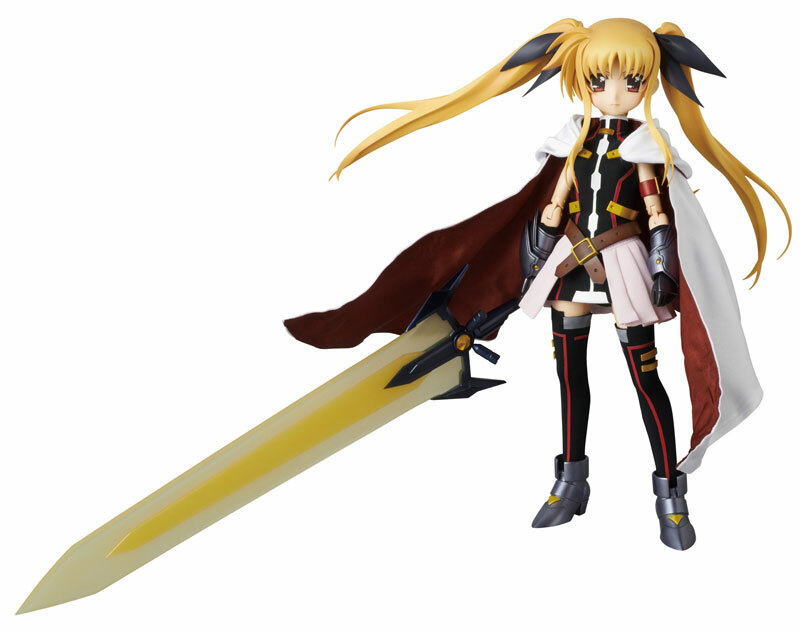 I like the designs from Nanoha in general, but I’ve never been a super big fan of Hayate’s child transformation. Her outfit looks much more fitting in her adult form to my eyes. Maybe because of that I am not a huge fan of this figure, I feel like I probably should be. Zigg: This is cool, partially because it’s super busy and there’s a lot going on here. That doesn’t mean a drop in quality though – Kyoko herself looks great and the really unique, interesting pose helps her stando ut from the crowd. I love the scattered accessories like the flying cup noodle, and the pain splattered base is an awesome extra. In a way I kind of hate the fact that Monobear is there, because he’s pretty distracting. Hopefully he can be removed. In any case, this is a figure full of life and creative spark, which really sells it to me. 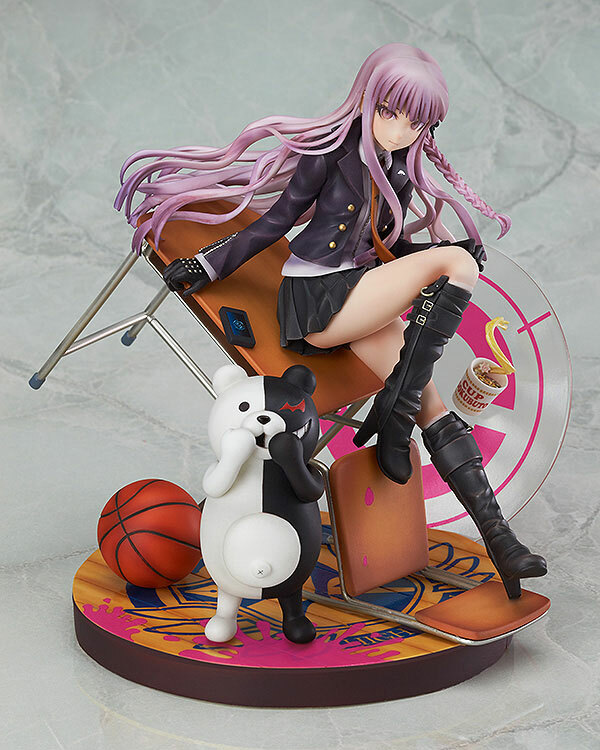 Jel: Someday I will try and understand what Dangan Ronpa is, especially when I keep seeing awesome things like this figure come out of it. There’s just so much going on here, from the weird accessories and sideways double-base to Monobear photo-bombing (or is it figure bombing?) the scene. Pretty impressed this is coming from Phat Company too, as it looks on par with any of the other top figure makers. Lifesong: I love the personality in the pose. I’m trying to ignore the relationship that this girl probably has to Monokuma as this figure is likely a massive spoiler, but it looks cool! Zigg:I love the outfit. Sorry, but it’s true. That weird combination of frilly skirt and…is that a dungaree cut top?… in that lovely minty green colour really make this figure stand out a lot. Plus she’s got that great base that the other Love Live! figures had too, and a very active, energetic pose. Once again it’s a great lesson on how to make what’s actually a swimsuit figure feel fresh and pretty, rather than creepy and exploitative. Jel: These Love Live figures have been pretty great so far, and that really cool splash base will make for a nice bit of visual continuity as they continue to make the rest of the girls. I like that the outfit and color scheme has just the right amount of gaudiness to qualify as something an idol would wear without being skeevy. I still could care less about the series, but fans should be thrilled at the quality work their getting here. Lifesong: Kotobukyia is doing a good job with this line. Kotori Minami is another lively addition to the set. I especially like the colors and shading on her outfit. I am a bit concerned about her skirt, It looks like isn’t sitting on her hips right in the promo shots. They can probably be forced into place and it’s not a major issue either way, but it does make the skirt look a bit stiff. Zigg: Speaking of creepy and exploitative…this also makes absolutely no sense. What you get is a figure with a crappy looking uniform full of massive seam lines, and then a no-thank-you-officer school swimsuit underneath that’s both way too expensive and poorly painted and sculpted. Crappy face too. Avoid. Jel: Speaking of skeevy… do I have to devote more words to Oreimo? Even putting the source material aside, this fails on every level. 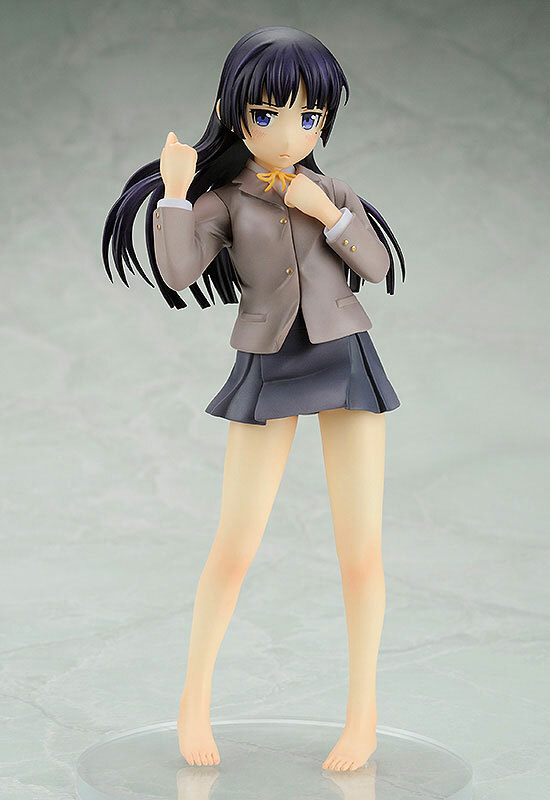 Her school uniform is super boring and just looks weird considering she’s barefoot and her swimsuit is a terrible sculpt that not even a perv could love. Cap it off with that flat, dead face and I can safely say I never want to see this again. Lifesong: No. That is all the brain power I am willing to give this. Zigg: Two Nanoha entries, it’s just like the old days. 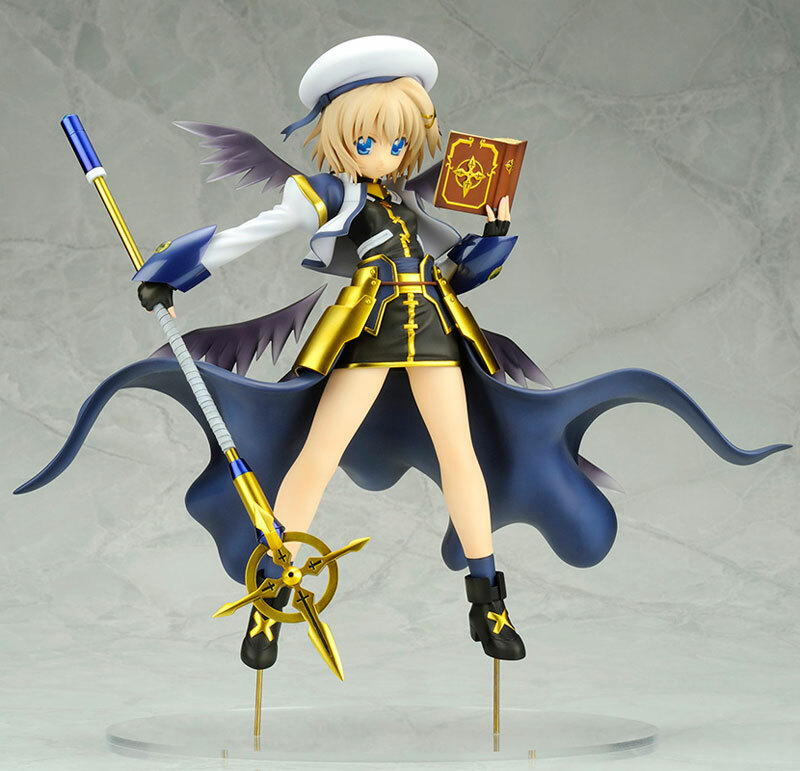 I have to say, this looks way, way better than I’d expect of a Fate RAH, mostly because they’ve gone for her most clothed form and RAH figures have always lived and died by their clothing. As ever, Medicom have done a great job, wisely escehwing any sort of attempt at faux-latex for a smart standard cloth look. I like this incarnation of Fate’s outfit – the tron lines are neat and the big white cape is a cool contrast to the black outfit. The inclusion of a gigantic Zanbar Form Bardiche is great, but given the money we’re paying, I’d expect a normal version as well. Still, if you’re up for it, this looks to be the usual quality product from the RAH line, and one of the best recent Fates. Jel: Oh look, more Nanoha already. I’m actually shocked Fate hasn’t gotten the RAH treatment already as it seems these things are almost as common as figmas lately. It’s nice work as always, but I’m not sure the cloth cape and MASSIVE sword are enough to compensate for the lack of any other accessories. I guess if you were crazy enough to pay for RAH Nanoha, might as well complete the set. Lifesong: I’ve never been a big fan of figures that mix cloth and plastic on the outfit. Either give me a doll with a full cloth outfit or a figure with plastic. Despite my complaints and general lack of interest in this line, Fate actually came out pretty well I think. Uhhh Zigg, about that Kirigiri figure? That’s not paint…. game fans know what I’m talking about.